2. Slowly lower the weight back down. Repeat until exhaustion. (Once you reach exhaustion, don’t try to heave or jerk the weight to get one last repetition in. Instead, just keep trying to produce the movement, even if it’s not ‘going’ anywhere, for another five seconds or so. If you’re using the appropriate amount of weight or resistance, you’ll be able to perform four to eight repetitions) Immediately switch to the next exercise for the next target muscle group, and repeat the first three steps done in this fashion, your workout will take no more than 12 or 15 minutes. While this may sound ridiculously short, once you’ve tried it, you’ll likely realize that it’s really all you can muster. This super-slow movement allows your muscle, at the microscopic level, to access the maximum number of cross-bridges between the protein filaments that produce movement in the muscle. “It’s sort of like a caterpillar or a centipede that’s crawling along a surface. If you start off moving very, very slowly, you’re going to engage more legs or more movement arms at the microscopic level. What you have in terms of movement is the difference between a centipede and a millipede, and that also produces very gradual movement. 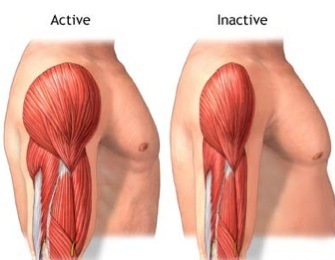 What the slow movement does is it keeps the muscle under a continuous load. It can never escape being under the stress of the weight, so the fatigue accumulates very quickly. I hope you will, too. I certainly am. Great Article! Its not about ‘reps’ and ‘smashing out’ the exercises, but taking time to do them in a controlled manor under load. Core Stability excises with an emphasis on slow control through a full range of movement is a great a base to work from. This form of training also works for those looking to reduce the rate of ‘osteoporosis’ too! Thanks for your kind words. You are right on about the benefits in fighting osteoporosis, too. Men are more vulnerable to it after the age of 55. HOW ABOUT FIR WOMEN.AGES 55-65? I WANT TO BUILD STRONGER MUSCLE, NOT look like Mr atlas. Thanks for your comment. Did you read the post? It all applies to women as well as men. I guarantee you won’t have to worry about looking like Charles Atlas.